Along with gorgeous fashion spreads, my August 1916 edition of The Designer magazine includes a fantastic assortment of advertisements illustration how people lived (or aspired to live) and what they bought (or aspired to buy) in the 1910s. Generally the food-related advertisements are more practical, and less aspirational, and the fashion & beauty related advertisements are very aspirational indeed. They show what to wear to balls, and at the best resorts, and on ocean liners, while linking them back to everyday products. 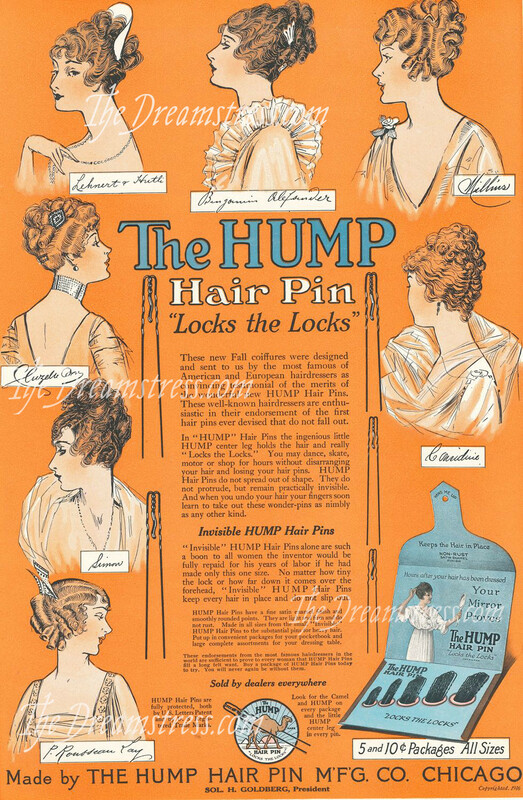 One of my favourite of the beauty ads is this one for The Hump Hairpin which “locks the locks”, featuring hairstyles purportedly designed by 7 of the leading hairstylists of the day. Each hairstyle, of course, is held in place with Hump Hairpins. The hairstyles are a wonderful glimpse into the changing coiffures of the mid 1910s. The move from low hairstyles, that sit on the nape of the neck, to high ones, with the volume concentrated at the top of the crown, is obvious. So too is the growing fashion for very defined curls and extremely sculpted ripples. Both owe their popularity to improvements in curling irons and hair setting lotions. The irons including the precursor to the one that made the famous ‘Marcel Wave’ of the ’20s. Marcelling tools were popularised and vastly improved during the 1910s. The electronic version of the Marcel waving iron was patented in 1918. It’s interesting to decipher the names of the hairdressers. I can read: Lehmert & Huth; Benjamin Alexander; Williams; P Rosseau Lay; and Simon. Sadly my two favourite hairstyles: the ladies on the left and the right, second row down, are the ones I can’t quite make out! It’s also interesting to compare the fabulous hairstyles of the fashionable hairstylists to the marketing of the hairpin. ‘The Hump Hairpin Locks the Locks’ goes on to describe all the things you can do without your hairpins falling out, or your hair growing dishevelled – clearly a problem that many women faced! We sometimes think of women of the past looking like they stepped out of a bandbox, but with fine slippery hair, holding a fashionably loose hairstyle in place would have been tricky (even in the days when weekly shampooing was more the norm). I’d really like to get a reproduction of these hairpins to see if they actually work! And a reproduction of each of these hairstyles…. What do you think? Would they hairpins work, or was it all marketing & hot air? And which is your favourite hairstyle? Well!! Why did they go out of production? I use hairpins to hold my plaited bun in place, and they do slip. I often find my hair-do looking more dramatic that it was meant to, with pins akimbo! The hump (NOT a great name!) could very well encourage them to stay in place. I like the range of sizes, too. Not much choice in hairpins, these days. I rather like the Simon one. If only my hair would take a curl. I’d need wigs to achieve these styles. Have you tried using hair sticks? I use hair sticks all the time for buns – even braided ones- and the bun never falls out. Bobby pins won’t hold the weight of the hair. I naturally have exactly the hair texture for these styles, but even so I doubt those pins could hold it in place for more than a minute or two, they look so flimsy. I imagine they would work much better if the center ‘leg’ was a similar length as the outer ones. Either way, I wouldn’t mind wearing any of the styles in the top row, though I’d leave off the ornamental paper plate the lady on the left is wearing. Leimomi. . they do work, and very well! I have a package; mine is a few years earlier and is Hump brand with a CAMEL on the package! I figure that’s the kind of hairpins I’d need for my fine, straight hair. Cluzelle Bros., Ladies’ Hairdressers, 12-14 W. 37th St., New York (City). This from a 1916 ad in the New York Times. I’m partial to the style whose signature we can’t read. Thank you! I knew there must be ads for the hairdressers out there somewhere! I’d like to try this type of hairpin, it does look as if it might stay put better than an ordinary one. And having multiple sizes of the same design seems very practical. I have hairpins marketed to dancers that work very well for keeping a bun in place. They’d be too large for some parts of elaborate hairstyles like these, though. I think my favorite hairstyle is the lady on the left in the second row. But if the lady on the left in the top row was wearing a really elaborate mantilla comb, that one would probably win. 🙂 Might the last hairdresser’s name be Carridine? Fine and slippery hair is precisely why I cut mine off! Truly, those look really helpful. My longer hair definitely held up better with hairpins than bobbypins. These might have worked even better. Searching Google for “the Hump Hairpin” is interesting. I just listed these on my Etsy shop. Your blog came up when I researched them. I will reference your blog. I bought a pkg of 3 sizes these about 20 years ago in an antique shop. They were the BEST that I have ever tried. I had extremely long (knee length, fine but thick) straight hair at the time. Eventually I lost them one by one as I played volleyball, mowed the lawn, hardened or did housework. I am waiting to be in the right place at the right time to get my hands on some more.